This Chili's Margarita Grilled Chicken is a copycat recipe of one of your restaurant favourites! 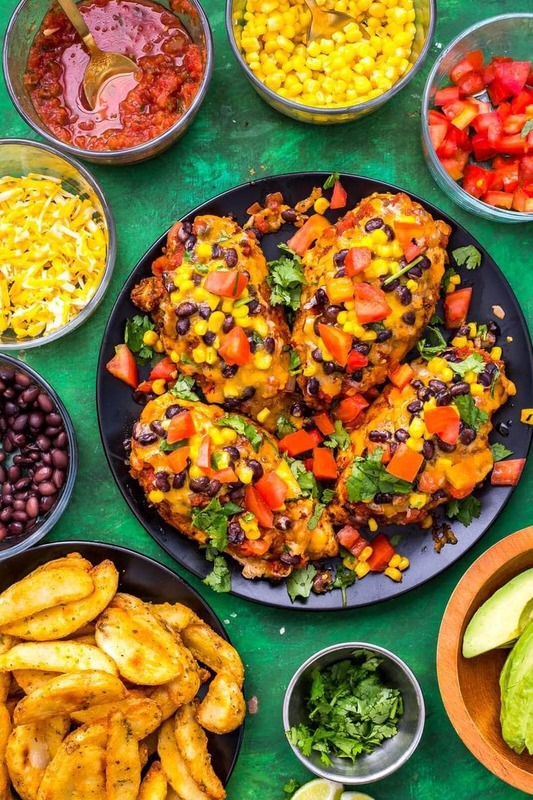 Topped with cheese, corn, black beans and salsa, you'll be craving these delicious loaded chicken breasts every night! Preheat oven to 400 F. Rub chicken breasts with olive oil, taco seasoning and salt. Bake in the oven 20 minutes. Remove chicken from oven, then top with salsa, corn, black beans and cheese. Bake another 10 minutes until cheese is melted. Remove chicken from oven and top with diced tomatoes and cilantro. Add sliced avocado and lime on the side. I served frozen potato wedges with my chicken as a side dish but that's optional; you could also do sweet potato fries, a side salad, sauteed spinach or more. The choice is up to you!